Wired Control: Simply plug the cable built in the selfie stick into your smartphone, and press the shutter button on the handle to start taking photos. No bluetooth connection, no battery recharge, just plug and play. All Angle Shooting: The phone can be steadily clasped on the holder, and rotate 360° horizontally and 180° vertically. This patented 2D adjustable design covers all the angles for your selfies. Extendable Monopad: The stick of this monopod can be easily extended to a max 35in, and shortened to a min 9in, which fits perfectly in your pocket and is super light and portable to carry on a trip. Universal Compatibility: This selfie stick is compatible with most cell phones in the market, such as Apple iOS and Android devices. 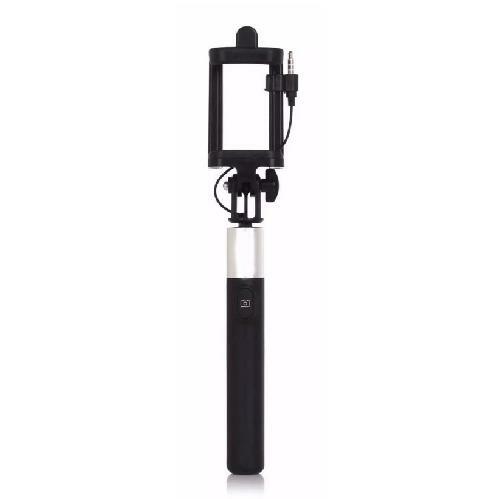 High Quality: The durable, stylish selfie stick is made of premium aluminum alloy and hard PC. The 1/4" screw thread at the bottom of the stick can attach to a tripod for panorama.